The planets aligned with the stars shining favorably on the political fundraiser for Mayor Dawn Zimmer. One rising star brought plenty of supernova power with him. That would be presumed Democratic nominee for governor Phil Murphy. 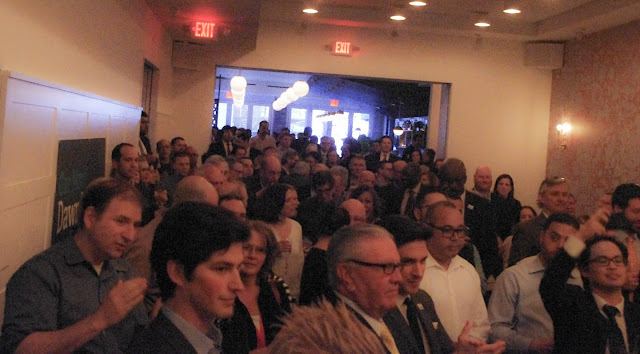 Hundreds filled the room at the new restaurant at 14th and Willow, Porter Collins and the good will overflowed embracing most of Hoboken if not Hudson County. 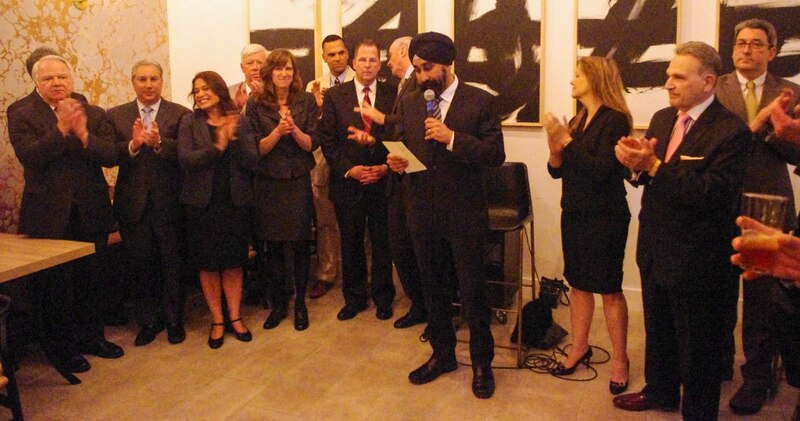 Councilman Ravi Bhalla acts as emcee to the big bash at Porter Collins last night. Missing from this photo among the political signatories is State Senator Sandra Cunningham who arrived late for this photo but stood near the new Hudson County Freeholder Chairman Anthony Vainieri and Weehawken Mayor Richard Turner (l). To the rear of Councilman Bhalla is Phil Murphy and State Senator Brian Stack. The new large uptown restaurant was jammed wall to wall with politicos of all stripes mixing with long time Hoboken Reform activists. The crowd into the hundreds was a mosh pit mingling in the juice of those in the know, in power or anticipating both. This was the biggest fundraiser in Hoboken in some years if not in earnings, certainly in political powers. Most of Hudson County paid homage to Mayor Zimmer and also to its rising adopted son in Phil Murphy. 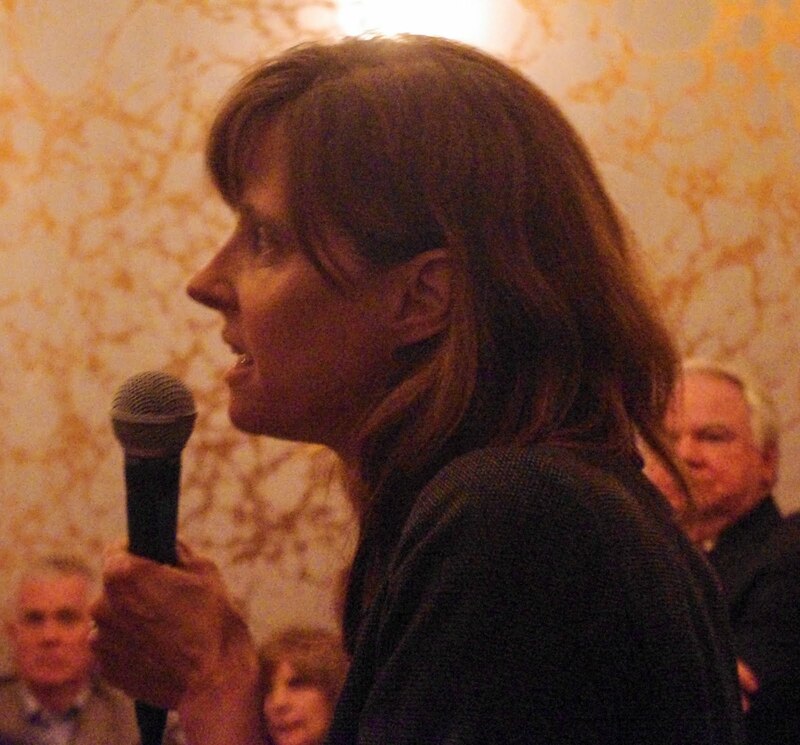 Mayor Dawn Zimmer addresses the huge crowd at Porter Collins last night. The atmosphere was one less of pending campaigns than a celebration. The celebration of expectancy and some harsh words for the current governor didn't dampen the overall positive event. Inevitability was in all practicality, the theme of the evening and spirits were high with a slew of campaign hands from near and far. One observer commented, "I saw a lot of architects, engineers and lawyers" and chuckled this must be the winner's circle. No one would muster an argument to disagree. 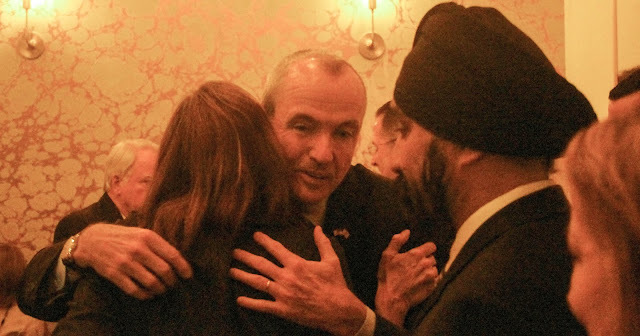 Former US Ambassador to Germany, Phil Murphy gives Mayor Dawn Zimmer a hug after her remarks last night. The actual haul from the event should significantly give a lift to the current funds on hand for the mayor's upcoming re-election set for November. Her opposition is not exactly set and the squabble among them is not making the likelihood of an upset appear any more likely. The YUGE crowd at Porter Collins for the Mayor Zimmer fundraiser.